My friend Sab and I went to the same high school and even attended the same organization then but it's funny that we only really came to know each other and became close via the Internet last year. She's a fellow blogger who shares stories about her exciting family life. Photos of her cute little ones never fail to make someone go "awwww". I guess it's because of our many similarities that made us click. First is our love for the color pink in fact, both of our cameras are of a similar shade of metallic pink. We both love cream-based pasta and can easily agree on which restaurant to meet up due to our similar taste in food. We love getting manicure and pedicure treatments which was actually where we first bonded together with cute little Sophie. Lastly, the loves of our lives both share the same last name so pretty soon, like her, I will also be a Mrs. Ang! After going through the crazy holiday season of never-ending dinner outs and Christmas parties, Sab and I agreed to meet up one cozy Saturday lunch at UCC Vienna Cafe. I found out that she also loves this coffee shop not only for its coffee drinks but for its yummy dishes too! 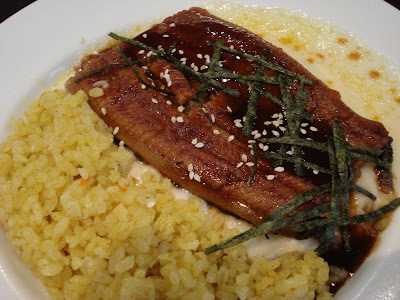 Scanning the menu, I decided to follow her lead and order the Unagi (Eel) Rice Casserole (Php. 399). Sab told me how much she loves UCC's rice casserole because of its aromatic curry flavor and its top quality unagi. I couldn't agree more. While swapping stories on how our holiday break went, we digged into our plates of rice casserole. I love the creamy white sauce that tops my curry rice. They also added a layer of melted mozzarella cheese which added more character to the dish. The unagi was delicious! Grilled and seasoned to perfection, the meat was so soft that I just savored every single bite. I like it that UCC took the extra step in making sure that the unagi is boneless to avoid any unnecessary discomfort caused by swallowing a tiny fish bone. After enjoying our meal, we ordered a coffee drink to give us more reason to continue bonding. I got my favorite UCC House Blend (Php. 99) while Sab got a cold coffee drink called Mocha Cooler (Php. 145). UCC Vienna Cafe has more than 10 branches around the metro. They have branches in Trinoma, Connecticut Greenhills, Paseo Center in Makati, Rockwell Center and a lot more! Thank you Frannie for your post! Glad you enjoyed your experience at UCC!